Femtosecond and subfemtosecond time scales typically rule electron dynamics at metal surfaces. Recent advances in experimental techniques allow the experimental study of such dynamics. In this talk, we shall analyze electron dynamics at surfaces and nanostructures with emphasis on screening times, spin dependence of charge transfer of adsorbates and smaller system sizes. We will discuss the effect of energy gaps on possible “Veselago lenses” for completely flat graphene sheets. 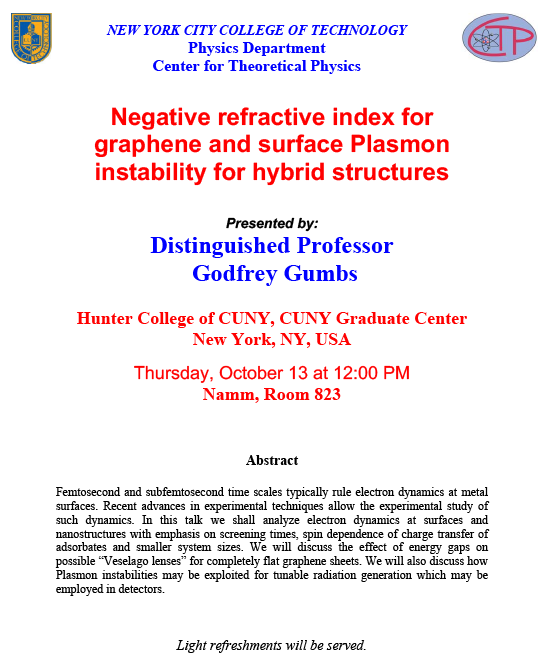 We will also discuss how Plasmon instabilities may be exploited for tunable radiation generation which may be employed in detectors. Why does nature like the square root of negative one? Quantum mechanics is a probabilistic theory, but the way we compute probabilities in quantum mechanics is quite different from what one would expect from, say, rolling dice or tossing coins. To get a quantum probability, we first compute a complex-valued probability amplitude and then square its magnitude. I begin this talk by looking for a deeper explanation of the appearance of probability amplitudes, or “square roots of probability,” in the physical world. It turns out that one can find a potential explanation—it is based on a principle of optimal information transfer—but the argument works only if the square roots are real rather than complex. I then discuss a few of the ideas people have put forward to try to understand why nature favors complex amplitudes. At present no such idea has gained wide acceptance, but the effort to answer this question has produced insights into the structure of quantum theory. When interacting ultracold atoms are loaded into the metastable but long lived higher orbital excited bands of an optical lattice, would it be possible for the atoms to exhibit conceptually novel phases that have no prior analogue from the well-known past condensed matter models? In this talk, I will report some of our recent findings when exploiting symmetries, quantum phases, and topology beyond natural conditions in such artificial quantum orbital systems. [icon name=”clock-o” class=”” unprefixed_class=””] Time: 12:45 p.m.
Competition graphs and graph pebbling are two examples of graph theoretical-type games played on a graph under well-defined conditions. In the case of graph pebbling, the pebbling number pi(G) of a graph G is the minimum number of pebbles necessary to guarantee that, regardless of distribution of pebbles and regardless of the target vertex, there exists a sequence of pebbling moves that results in placing a pebble on the target vertex. A class-0 graph is one in which the pebbling number is the order of the graph, pi(G)=|V(G)|. This talk will consider under what conditions the edge set of a graph G can be partitioned into k class-0 subgraphs, k a positive integer. Furthermore, suppose D is a simple digraph with vetex set V(D) and edge set E(D). The competition graph G(V(G),E(G)) of D is defined as a graph with vertex set V(G)=V(D) and edge vw in E(G) if and only if for some vertex u in V, there exist directed edges (u,v) and (u,w) in E(D). This talk will present some recent results on forbidden subgraphs of a family of competition graphs. [icon name=”clock-o” class=”” unprefixed_class=””] Time: 12:00 p.m.
Exciton-polaritons generated by light-induced potentials can spontaneously condense into macroscopic quantum states that display nontrivial spatial and temporal density modulation. While these patterns and their dynamics can be reproduced through the solution of the generalized Gross-Pitaevskii equation (GPE), a predictive theory of their thresholds, oscillation frequencies, and multi-pattern interactions has so far been lacking. Here we represent such an approach based on current-carrying quasi-modes of the non-Hermitian potential induced by the pump. The presented theory allows us to capture the patterns formed in the steady-state directly and account for the nonlinearities exactly in GPE. We find a simple but powerful expression for thresholds of condensation and the associated frequencies of oscillations, quantifying the contribution of particle formation, leakage, and interactions. We also show that the evolution of the condensate with increasing pump strength is strongly geometry dependent and can display contrasting features such as enhancement or reduction of the spatial localization of the condensate. The comparison with two independent experiments will be discussed.